At a time when issues of immigration and asylum are much in the news, it is good to read the memoir of a woman lawyer who, because of a combination of advocacy by her brother and good fortune, was able to escape Nazi Germany at age 5, first to Belgium and then to the United States. Sonia Pressman Fuentes had a long and distinguished legal career. Notable achievements were serving as the first woman lawyer in the General Counsel's office at the Equal Employment Opportunity Commission and co-founding the National Organization for Women. Her book Eat First--You Don't Know What They'll Give You: The Adventures of an Immigrant Family and Their Feminist Daughter is not about those achievements, however. Instead, it is a highly readable and often humorous account of the challenges of growing up as a refugee in America and embarking on a legal career when women lawyers or, indeed "career women," were very much the exception. It's a reminder that those who make great contributions to America sometimes are fleeing difficult circumstances without wealth, English skills, or important family connections, yet they do bring determination, resilience, and new perspectives. Sonia Pressman Fuentes now lives in Sarasota, Florida and continues to write and speak about women's issues. "Imagine having changed the course of history. Sonia Pressman Fuentes. . . , one of the founders of the National Organization for Women (NOW) along with Betty Friedan and others, actually did . . . Her story could have been told in anger or bitterness, but that's not Fuentes' personal, or literary, style. "It's my way of looking at life," she says. "My life wasn't funny. I just tell it that way." In its October 2005 newsletter, Xlibris, the publisher of Eat First--You Don't Know What They'll Give You, congratulated Sonia Pressman Fuentes for being "[o]ne of the most successful Xlibris authors ever." A child who emigrated from Nazi Germany, arriving in New York with her parents and brother in 1934. First woman attorney in the Office of the General Counsel at the Equal Employment Opportunity Commission (EEOC). Co-founder of the National Organization for Women (NOW) and Federally Employed Women (FEW). Speaker on women's rights issues before audiences in the U.S., Europe and Asia. Included in What Happened to the Children Who Fled Nazi Persecution (2006), Feminists Who Changed America, 1963-1975 (2006) and Women of Achievement in Maryland History (2002). 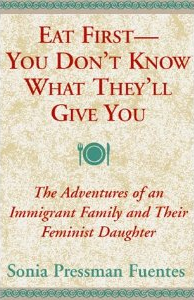 Author of the memoir: Eat First -- You Don't Know What They'll Give You, The Adventures of an Immigrant Family and Their Feminist Daughter. Sonia Pressman Fuentes graduated Phi Beta Kappa from Cornell University in 1950 and first in her class at the University of Miami School of Law in 1957. She had a 36-year career as an attorney and executive with the federal government and national corporations. She drafted many of the EEOC's initial landmark guidelines and decisions. In addition to being one of the founders of NOW, she was also a founder of the Women's Equity Action League (WEAL) and Federally Employed Women (FEW). Currently, she serves on the advisory committees of the Veteran Feminists of America (VFA) and the Longboat Key Education Center in Longboat Key, FL. On October 10, 1999, Ms. Fuentes was one of four recipients of the 1999 Women at Work Award given by Wider Opportunities for Women (WOW). WOW, a nationwide organization based in Washington, DC, has programs to help women and their families achieve economic self-sufficiency. Fuentes received the award for her commitment to women's issues and her leadership in the fields of law and business. Prior awardees include Glenn Close, Jane Fonda, Katie Couric, and Hillary Rodham Clinton. "I walk in the footprints of Sonia Pressman Fuentes." "As I really realized how bad off women were by the mid-70's, I was appalled, . . . . The champion of women at that time...was Sonia Pressman. She fought the airlines. She fought for the airline stewardesses...She was an EEOC attorney...But Sunny' Pressman...was small and she was dynamic, and don't get in her way. She was one of the gentlest souls you'd ever want to meet, but she was as tough as nails. She took on the airlines and the cause of the flight attendants. Sunny' Pressman is almost single-handedly responsible for flight attendants being married, for their being over 30 and working." -- Dorothy Howze, Making a Right a Reality: An Oral History of the Early Years of the EEOC, 1965-72 (EEOC, 1990). Sonia was a charter member of the Veteran Feminists of America, which was founded in 1992 to tell the stories of the Second Wave of the feminist movement, from 1963 to 1982. Profile of 15-year-old feminist activist, Minna Stein, in the Sarasota Herald-Tribune on May 15, 2016, which Sonia arranged. In early 2016, Sonia received an email from a Sarasota woman of 15, Minnah Stein, who'd learned about Sonia from the friend of a friend. Minna wrote that she couldn't believe Sonia was in Sarasota where she lived and wanted to meet her.Â Minnah and her mother visited Sonia in her condo, and Minna and Sonia remained in touch thereafter.Â When Sonia realized how remarkable Minna was, she suggested to Carrie Seidman, who does Sunday profiles for the Sarasota Herald-Tribune, as well as covering art and other subjects, that she write a profile of Minnah. Carrie immediately agreed, and the profile, which appeared on Sunday, March 15, 2016. Read the profile here. On Feb. 29, 2016, the Veteran Feminists ofÂ America published an ebook, Our Fabulous Feminists, a biographical compendium of 95 Second Wave pioneers, one of whom is Sonia. Her bio can be found on page 291.